So, after putting away enough food for a small country and trying out some fun new "snacks", I kind of just took a nap. I mean, it's a lot of work to pick that much food up and place it in a basket and then pick it up again and put it on a conveyor belt and then pick it up again and put it in my car only to pick it up AGAIN to put it into some sort of cupboard or find hiding places for all the good stuff. Anyway, after sleeping off my sugar coma, I had this genius idea to just make the turkey head. I found the perfect cutter and got to rolling and cutting and baking. I was so pleased with this little gem that I gave myself the rest of the weekend off. And I was feeling migh-tee proud of my fantastic little idea all weekend long. And then on Monday morning, I woke up and I saw THIS at The Sweet Adventures of Sugarbelle. And THIS at The Bearfoot Baker. 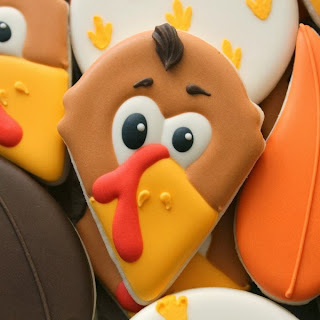 So I am hereby declaring it The Year of The Turkey Heads. And it doesn't even have to be just cookies. Instead of the traditional turkey hand project, you could just do the thumb and save 80% of your time. Go ahead and celebrate now. It's going to change your world. Probably. I mean, it might. There's always that chance. 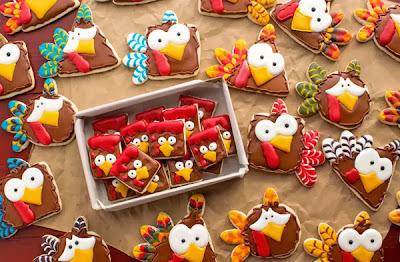 How to make decorated turkey head sugar cookies for Thanksgiving. Use 20 second orange icing and a #3 tip to outline and fill the beak area. (If you were a naming person, what would you name the shape of the beak? Diamondy-ish?) Let that dry for 30 minutes. Using 20 second brown icing add an oval head and let dry for another 30 minutes or so. Plenty of time to make a thumb-head pumpkin if you ask me. Use 20 second red icing and a #3 tip to make the snood. I just made a circle and then swooped it back up toward the top of the beak. 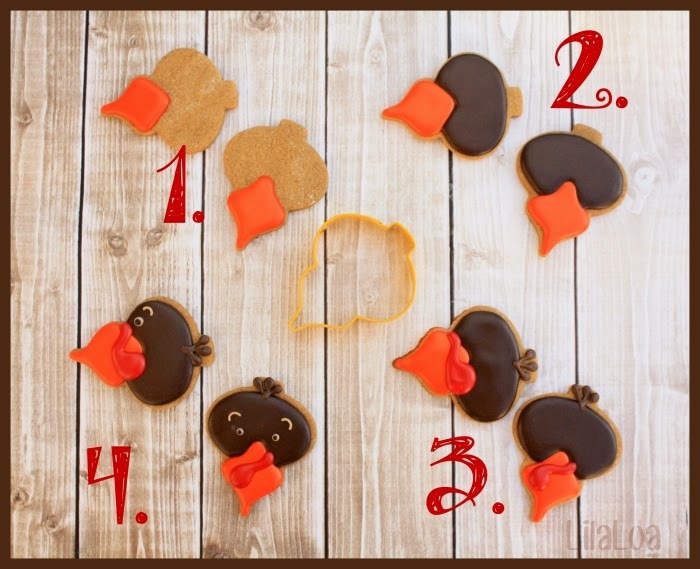 Use a #1.5 tip and the brown icing to make 3 little tufts of feathers on the top or side of the head. You don't even have to let step 3 dry. Just move right along to the eyeballs. I used tan icing and a #1.5 tip to create the base of the eyeballs and the eyebrows. And then just dropped a tiny dot of black on top to create the center of the eye. You could use white instead of tan if you wanted to. I mean, if you only let the head dry for 30 minutes, it's probably just going to bleed into the white and make it look tan anyway, right? 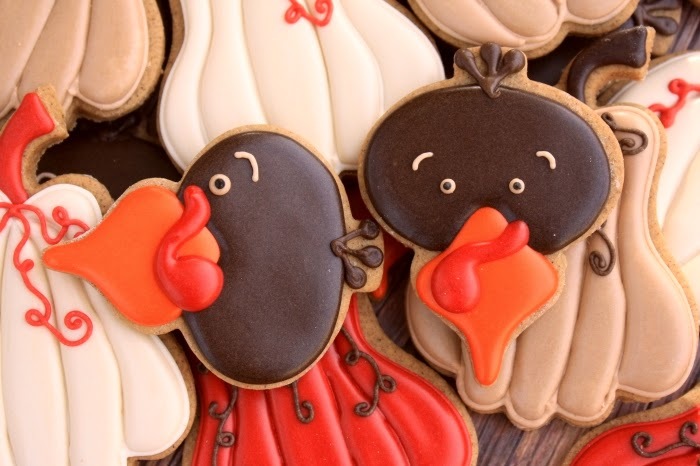 Why color more icing when the cookie will do it for you? 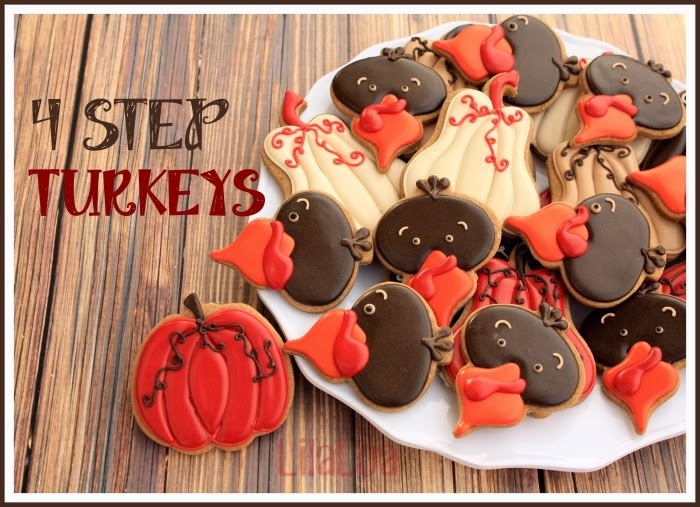 Grab the supplies: TURKEY CUTTER, ROUND PUMPKIN CUTTER, and TALL PUMPKIN CUTTER. Make some fun STENCILED TURKEY COOKIES to dress things up a bit! 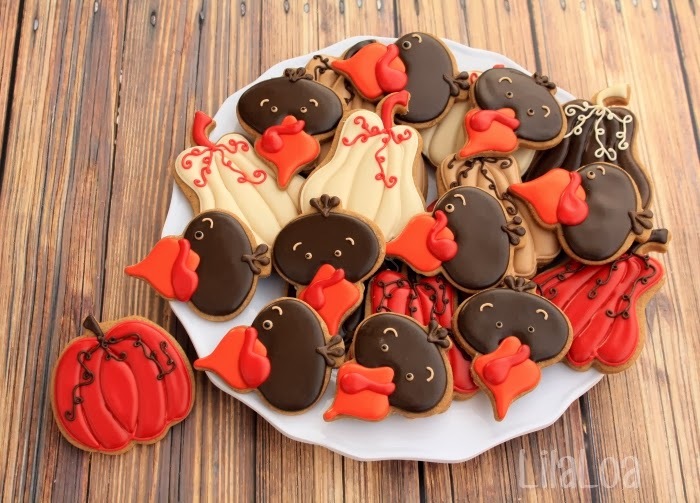 Or add some easy and brightly colored FALL LEAF COOKIES to the platter!